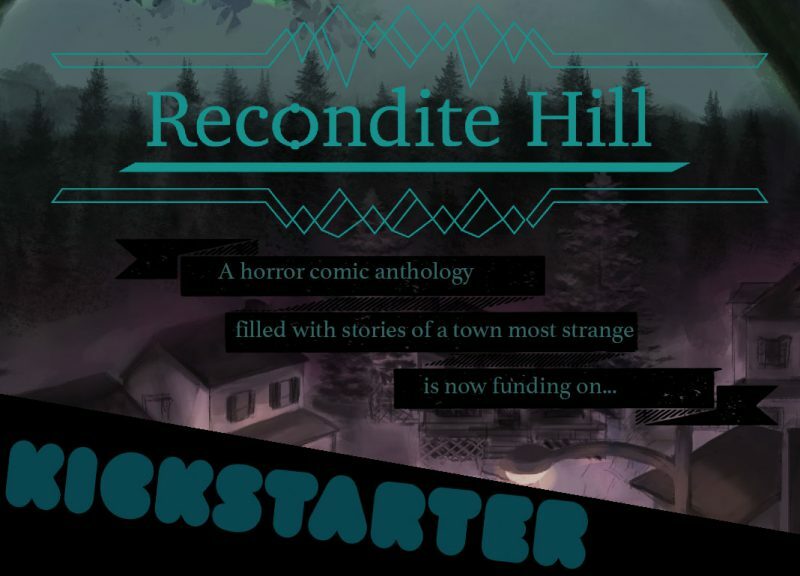 Welcome to the town of Recondite Hill. This small town is home to the bizarre and monstrous things that lurk at the edge of the darkness. The weird and strange that creep into local legend and folklore, warping a location into a mysterious hot spot of ‘what ifs’ and camp fire stories. GenderTerror had the pleasure of meeting the founders of Recondite Hill and asking them about their project to try and capture the strange happenstance that occur here. GenderTerror: Where did the idea of Recondite Hill come from? Steph: I am a huge fan of horror comics. I had come up with the idea after listening to audio stories of people’s hometown legends and I wanted to make something similar in comic form, but also allow people the freedom to come up with ideas of their own. GT: Is there any meaning behind the name? S: The original name for the project was going to be “Cryptic Anthology,” but I changed it because there was some confusion about what the premise was. I wanted to make it more specific to a nebulous spooky town, and I like towns with weird names. Jaci: “Recondite” is a synonym for “cryptic”, so the original name is still there in spirit! GT: How long have you been working on this anthology? S: I’ve been working on it since the end of 2016, at first just workshopping the idea and asking other people who have worked on anthologies for advice. J: Then Steph brought me on around November of 2017, when we had received all the pitches and had to choose which artists and writers we were going to include in the anthology. And we’ve been working on it ever since! GT: What types of horror inspire you? Does this reflect in the stories chosen for the anthology? S: I absolutely adore ‘creature features.’ Horror stories that focus on supernatural/ paranormal beings and how normal people react to unexpected run-ins with these sorts of creatures always have a special kind of pull for me. I really enjoy those kinds of stories that try to keep at least one foot grounded in a semblance of reality. As for the anthology, its central theme surrounds the concept of local cryptids, which I love. J: I love horror that deals with eerie stuff, horror that gives you that sinking feeling in your stomach, and makes your nerves creep up your spine. Things that leave you unsettled, with the feeling that something is just off; that’s the stuff I love. That definitely came up when we were picking the stories. It balanced well with Steph’s specialty in cryptids and monsters. We have a really cool mix of both eerie and more standard scary monsters, which I really love about this anthology. GT: How does it feel to have your vision interrupted by different people? S: I’m so excited honestly. I really enjoyed running this anthology and seeing all the wonderful unique takes on my favorite genre. I’m really impressed with how many unique takes on the prompt people came up with. GT: Did you contribute to this anthology? If so, how? S: For this anthology I wasn’t able to actually contribute any art or writing personally, since I was running it and also working on classes and had other responsibilities. I also didn’t feel quite right about having my own work in this anthology I was personally running – I wanted to make space for other creators to be seen instead for this project. J: I have a bit of my writing in the book; I did a little bit of flavor text for the book forward and the back of the book. I also have a limited reward tier to have me write a piece of flash fiction for you, if you’re interested in my writing! GT: What are you most excited by for this project? S: Personally I’m really excited about having printed something. Everyone involved put in an incredible amount of work to make this project come together. Working together with a bunch of cool artists and having a real, physical book at the end with my name in it? It’s like i’m a real professional comics person! J: Everything! I’m excited to see all of these awesome stories and illustrations in print. Seeing this thing we’ve been working on in physical form is something I’m really looking forward to. This is the first time I’ve worked on something like this so it’s all new and exciting for me. GT: Any planned future projects? 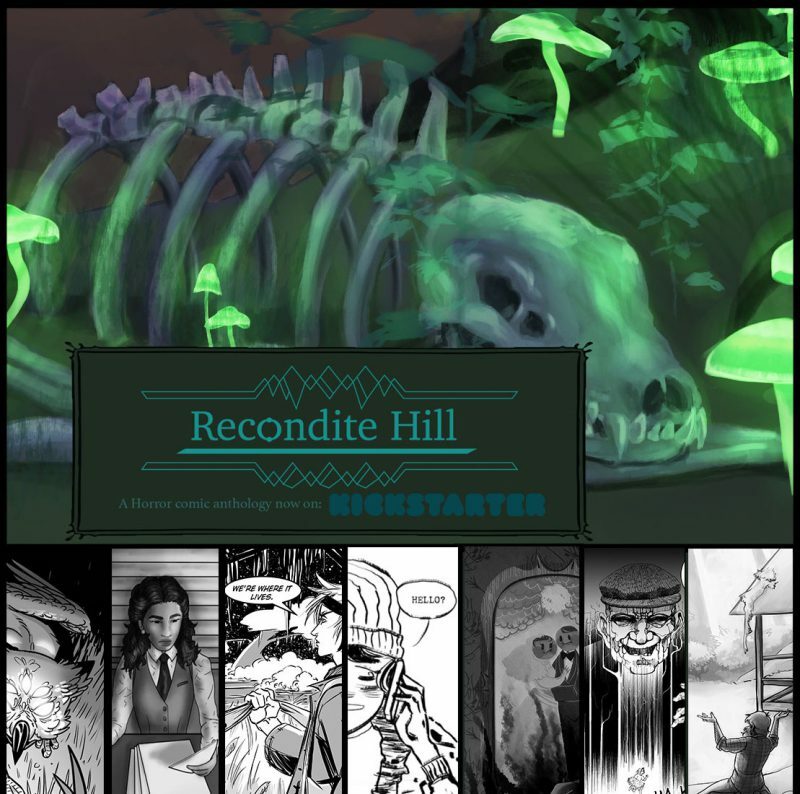 S: If this project goes well, we hope to have two more books surrounding Recondite Hill. This first anthology is Things to See, the next two would be Persons of Interest, and Strange Place. J: We also have some other (non-anthology related) things we want to work on together, which we hope to start working on after the Kickstarter and book are done!